We make our designs "sustainable", with minimal environmental impact, from "cradle to grave". We buy our materials from local venders (usually "mom and pop" family-owned businesses), supporting our local economy. We try to reduce the waste we produce, by re-using cut-offs for small projects (lamps, Judd Boxes and cutting-boards) and by donating our hardwood shavings to local farms for compost. When possible, we offer our time and products to not-for-profit organizations (art, youth empowerment, and ecology). Feel free to contact us if you'd like to discuss how we can help a community project that's important to you. We made a conference table using their discarded piano lids for this amazing NYC based not-for-profit. We custom made wooden cases that the senseis use for transporting swords and ritual items as they travel from class to class. We designed, built, and donated two items, a room divider and desk (from Sing for Hope piano parts) for use at their theater, or to auction to raise funds. We volunteered time, tools and materials to train teens from both USA and Nicaragua in furniture making. The collaborative team made benches and tables for a community library in rural Nicaragua. We've made several cutting-boards to provide modest help raising money. 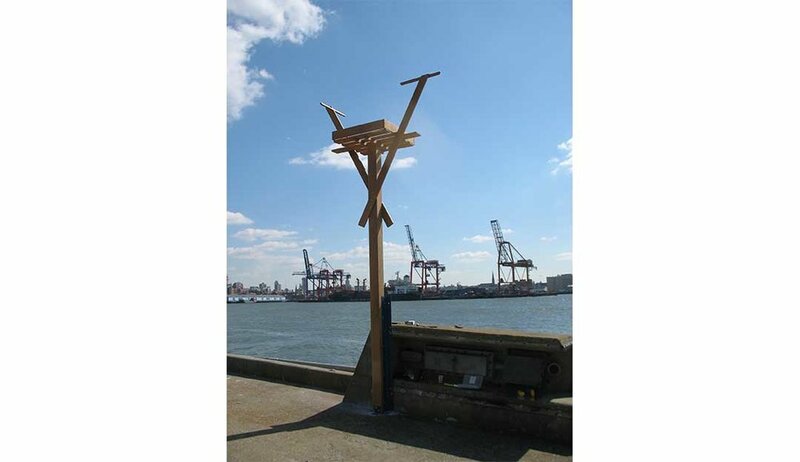 Working together with Brooklyn Based Environmentalist, Bart Chezar, we built and installed 2 osprey nests in NYC harbors. Black Locust lumber was donated by Horizon Wood Products with the intention of helping to re-establishment of this majestic, endangered bird to our local ecosystem. We donate our hardwood shaving to local gardens which they use as compost/mulch, and at the same time, reducing our waste stream.